Green IT has emerged as an important research topic in information systems and in other areas, such as business sustainability management. Some progress has been made in our understandings of green IT in a wide area of research topics, ranging from the green IT definition to the motivation for adopting green IT by organizations. This paper provides a holistic review and explanation of why organizations adopt green IT. 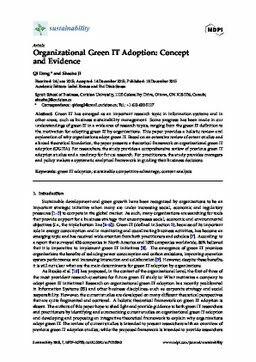 Based on an extensive review of extant studies and a broad theoretical foundation, the paper presents a theoretical framework on organizational green IT adoption (OGITA). For researchers, the study provides a comprehensive review of previous green IT adoption studies and a roadmap for future research. For practitioners, the study provides managers and policy makers a systematic analytical framework in guiding their business decisions.